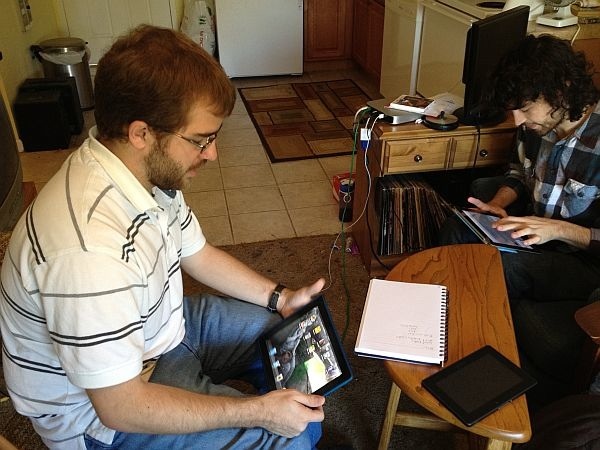 Our friends at IndustryGamers talked with recent college grads who formed mobile startup Team Krinoid. Getting a foothold in the industry isn't so easy. The game industry has entered a new era of startups, thanks to the rise of mobile platforms and digital distribution becoming widespread on PCs and consoles. Apple's App Store and the Android Market have catalyzed the formation of tens of thousands of developers, and Steam has done its part to make the idea of becoming a game developer easier than ever before. Of course, many new game companies are formed by industry veterans, who use their experience and contacts to generate a large pile of investment capital. There are plenty of startups who think of themselves as lean and mean, barely eking out an existence on a paltry million dollars or two in angel funding while they put together their Great Idea. Those guys have it easy. The other end of the spectrum is exemplified by Team Krinoid, a small band of recent college grads who started their game company as a student project, and now pursue it full-time... well, sort of. Freelance work is keeping the bills paid until the games can reach their potential. Team Krinoid was founded by three University of California at Santa Cruz (UCSC) students, as an outgrowth of the 10 member student team that created their first game, the multi-touch space shooter Syz: EG for the iPad. The game was the senior project for the year-long game design course, and ended up winning the grand prize in the Baskin School of Engineering's 2011 Sammy awards for best student games. The three members of the team that founded Team Krinoid are John Peters, lead programmer and now CEO; Peter Hunter, who wrote the story and handled the music and sound; and Max Weinberg, artist. The genesis of of Team Krinoid started out over a year ago, when the eventual founders realized that instead of sitting around playing games during the summer, they could actually spend their time designing a game. Besides, they needed a senior project for the game design class. They always wanted to do the game as a professional quality project, though. "Some of the other teams, it just looked like they were working on a school project," said John Peters. "But we wanted ours to be a professional product." The biggest lesson they learned, admits Peters, was that it takes an immense amount of time to create a game. "We had to scale back our initial vision because it was too grand, " said Peter Hunter, who wrote the script. "But we plan to release more episodes, so we'll get to use all of the ideas we've had eventually." The game took a total of 23 people to put together, including all the voice actors, and a total of 8 programmers worked on it. Coordinating all the effort was hard, especially when the last month approached. "The game looked pretty much done, and it was only a month before graduation, so many people just started backing off," recalls Peters. "That last month was really a lot of hard work to get all the details done." Marketing has been a sticking point for the team, as none of them have marketing experience. "We've been promoting the game, sending out lots of emails, and we even had a friend create a "Making Of Syz: EG" documentary for us," notes Hunter. "But there are so many games out there, it's hard to get noticed." The team is hoping the innovative features of the gameplay, where you control the ship with one finger and the path of your weapons with another finger, will help attract buyers - that, and the effort they put into the story, and the characters, and the voice acting. "We have 375 lines of dialog in the game, " notes Hunter. Their marketing is still a work in progress, as they plan an update with Game Center support in the near future, and a Japanese version of the game is nearly ready. After that, a second episode of the game is scheduled for early next year. Peter is already working hard on a port of the game for the Blackberry Playbook, figuring that although it's a small market they should be able to stand out more easily since there are so few games available. Their next game, though, will be on every mobile platform. "We really want to be able to run on smartphones as well as tablets," said Peters. Their new game is going to be ready very soon, but they're being very hush-hush about it. For now. As Team Krinoid has come to realize, promotion is a very important part of the development process. The team is small, and the money is tight, and sales are slow, but the dedication and the dream is much bigger than all that. In the end, the persistence of Team Krinoid may be their strongest feature. This article first appeared on IndustryGamers.